Pontiac still a hotter Google keyword than Buick? Pontiac may be dead, phased out by parent company General Motors in the wake of its financial collapse, but you wouldn't know it from searching these interwebs. 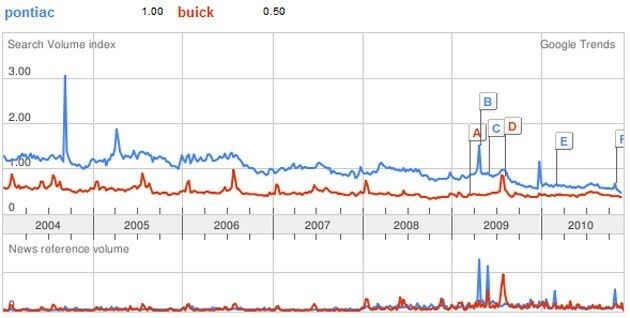 According to search trends tracked by BringPontiacBack.org, more people are still searching for Pontiac on Google than they are for Buick. This, despite Pontiac's demise and Buick's increased sales and marketing. The Trans Am loyalists admit that part of the discrepancy could come down to the city of Pontiac, Michigan, which is still standing. But would that be enough to account for Pontiac's 2:1 search popularity over Buick? Or is it that Buick's demographic has yet to figure out what the internet is? One way or another, the numbers are interesting. Hat tip to Christopher! Good thing I saw this, I was in the middle of bringing the AutoBlog article here. Im taking a look at the http://www.bringpontiacback.org site now. I was born in Pontiac Michigan. There's also a Pontiac Illinois! I want a Buick. WANT WANT WANT. Or is it that Buick's demographic has yet to figure out what the internet is? It is pretty interesting though. For what it's worth, I have been to Pontiac IL - Livinston County before. It lies on Historic Route 66 and houses a Route 66 museum. How in the world is there 2 Pontiac cities in the same state!? I'm glad I don't live in either of them, I have enough trouble with mail as it is! While infrequent, it happens more often than you might think. For example. Austin Texas is the most famous Austin, but there are two in Arkansas, one in Conway county andthe other is in Van Buren county. While I see these as factors in helping Pontiac in a keyword search, they shouldn't too much. For instance the person has to search "Pontiac" to go to these results if they search "Pontiac, Michigan" or "Pontiac, IL" it will not count towards "Pontiac" keyword search count. I'd say 1 in every 100 searches or more are for the city. Very true, if I were to want info about Pontiac, MI I wouldn't just type in Pontiac, because I'm about 99.9% sure that most people know Pontiac was a car company. Otherwise, the only Pontiac I know of is the Chief, and I doubt that many people are doing research on Chief Pontiac. Really. Many of the hits might be people looking for these other places/people, searching just "Pontiac," then realizing their mistake and adding in "Chief" or "Michigan" or whatever else they need to find what they are really looking for. That "might" happen but I see that chance being rather low due to the most recent generation is so lazy that they'd be copying and pasting to get google results and the older generation usually type exactly what they want in.